An opportunity to achieve the maximum result! Depending on the peculiarity of each person and on the treated body area it is possible to choose between different procedures to achieve the maximum result! The procedures can be applied on all body areas and skin types, including dark skin. The first results will be seen in 14 days on an average after the procedure when hair starts to fall out! Depending on the body area the duration of the procedure varies between 15 minutes and 3 hours. In order to maximize the results it is recommended to perform 1-8 procedures at 4-8 week intervals. To maintain the results we recommend you to repeat the procedure, as needed. Before the ELOS™ Laser and photo depilation procedure you will have a consultation with a laser specialist who will determine your skin type, test your skin reaction to an energy pulse and examine any possible contraindications to the procedure. According to the body area and skin type it is possible to choose the most suitable procedure that would give the best results in the particular case. Technologically the purpose of the procedures is the same: to increase temperature in a hair follicle to the extent where the hair dies. As a result, hair growth will weaken and stop eventually. 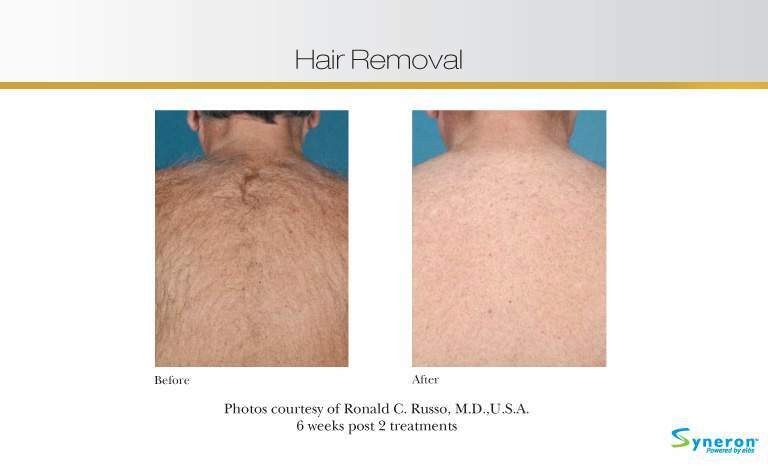 Repeated hair removal procedures are necessary to affect hair in the active cycle of its growth. Only at this stage can the heat destroy hair follicles. Growth stages are different for each hair and their growth cycles vary in different areas. For example, if 65% of facial hair is in Anagen stage then at the same time only 20% of the hair on the legs is in Anagen stage. Hair growth cycles also vary from individual to individual depending on gender, age, ethnic origin, hormonal status etc. 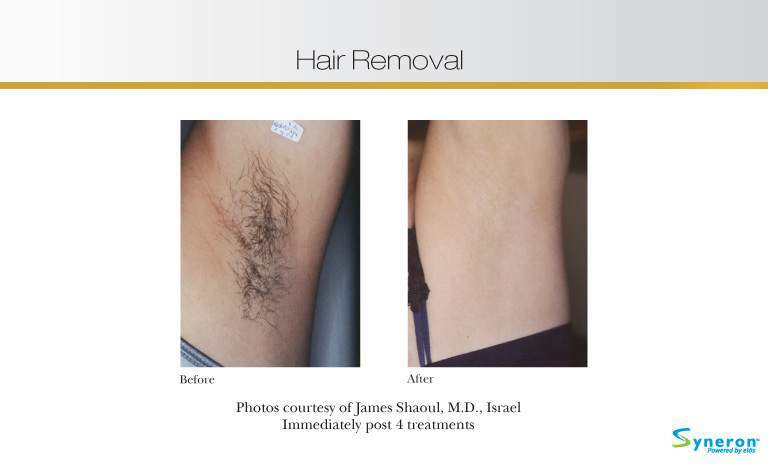 ELOS™ technology uses two different energy sources to remove hair – light (IRL or laser) and bi-polar radio frequency which together give the advantage over other photothermolysis-based hair removal methods like usual laser or photo depilation. ELOS™ photo depilation uses 680-980 nm of filtered spectrum of pulsed light and ELOS™ laser depilation uses 810 nm which ensures the selective absorption of light in hair follicle. As a result, heat in the target (hair follicle) increases to the temperature which is higher compared to the surrounding tissues. The bio-electric properties of skin allow the radio frequency current to flow through the dermis. As all other electric waves, radio frequency travels better along the path of least resistance, which in this case is the hair follicle pre-heated with light. Therefore, the applied radio frequency energy focuses on the pre-heated area by increasing its temperature to the extent that is necessary for thermolysis. Thermolysis creates a biological effect and destroys hair follicles. Since light is only one part of ELOS™ technology it is possible to use the light energy safely to all types of skin. At the same time the cold contact nozzle cools epidermis by increasing skin’s power of resilience this way. As a result, absorption of radio frequency decreases in epidermis and better absorption of heat energy in the pre-heated area is ensured. ELOS™ technology uses two different heat energy sources to destroy hair follicles by combining light energy (red arrows) and energy of radio frequency (blue arrows). For comparison! One downside of laser and photo depilation based on usual photothermolysis is that it is necessary to have melanin in hair. Necessary amount of light energy has to absorb in melanin to produce heat in hair follicle, for achieving the sufficient temperature for thermolysis. The heat energy destroys the hair follicle. If there is not enough melanin in hair the absorption of enough light energy for thermolysis is not possible. The other downside of laser and photo depilation based on photothermolysis is a high risk of skin damage. People with darker skin have a high risk of unpleasant contraindications like skin burn, blisters, scarring and hyperpigmentation. This is because too much light energy is absorbed not in hair but in melanin in skin. It is recommended to come to the ELOS™ depilation procedure with clean skin and without having applied creams, parfumes and make-up. In case of dry skin it is recommended to moisturize it one day before the procedure. The treated area has to be shaved with razor blade 1-3 days before the procedure. At the day of procedure the length of the hair should be of 1-2 mm. If the hair has been shaved with wax or depilator it is recommended to wait for 4 weeks before the procedures (this is necessary to ensure the existence of new hair follicles).